Rehs Contemporary will be exhibiting at the 7th edition of Art Market San Francisco. On view will be a robust selection of work by many of our artists. The VIP preview is: Thursday, April 27 from 6 – 10 pm. General Show hours are: Friday & Saturday: 11:00 am – 7:00 pm, Sunday: 12:00 – 6:00 pm. We have several VIP passes … please email us if you would like one, or two! Our gallery exhibition – Skin & Tonic – will open on Thursday, May 4th, from 5:00 – 9:00 pm. Please join us for an evening of great art and cocktails (the latter sponsored by Perfect Vodka). On display will be over 100 works by Todd M. Casey and David Palumbo. Keep an eye out for the accompanying catalog which will be mailed in a few weeks. As with all of our previous gallery exhibitions, this one will open simultaneously at the gallery and on our website (all works will be available for purchase on the site). March has come and gone: the Euro closed at $1.067 (up a little); the Pound also improved - $1.253; Crude dropped -- closing at $50.69; and Gold made a tiny jump – closing at $1,249.80. As for the DOW … we opened the month at 20,812 and closed out at 20,663. Oh well … at least it was only a small drop. I was not expecting much from my stocks this month and after looking at the numbers that thought was confirmed: JP Morgan ($87.85 – down 4.43%), Exxon ($82 – down 1%), GE ($29.79 – down 0.70%), AT&T ($41.56 – down 0.97%), Verizon ($49.10 – down 2.56%), Wal-Mart ($72.08 – up 3.15%), Coke ($42.43 – up 0.59%), DuPont ($80.31 – up 0.63%), Merck ($63.53 – down 4.42%), Disney ($113.37 – up 2.44%), Intel ($36.07 – up 1.41%), Apple ($143.71 – up 3.14%), Apache (51.39 – down 1.53% - better than last month’s loss), IBM ($174.14 – down 3.51%) and Microsoft ($65.86 – up 2.47%). Of the 15 stocks listed, once again it was basically a wash in terms of the ups and downs – not very exciting! Hopefully April will bring on better results … remember, our new president did say he was going to: Make American Great Again! Funny thing is I have always thought America was great … shows you what I know. Since 1976, the trade of rhinoceros horns has been restricted in more than 180 countries under the Convention on International Trade in Endangered Species of Wild Fauna and Flora (CITES) Treaty. With no known predators, other than humans, the illegal trade has driven rhinos onto the endangered species list and their horns to a value greater than their weight in gold. In recent news, Jacob Chait, director of the natural history department and head of acquisitions at I.M. Chait Gallery and Auctioneers has been indicted for allegedly smuggling, dealing and attempting to sell at least 15 rhinoceros horns worth about $2.4 million. If Chait is found guilty of violating the Lacey Act, which bans illegal wildlife trafficking, he is facing a prison sentence that has a maximum of five years. Here is some good news - 67 out of 72 paintings stolen from a villa in Vienna-Hietzing have been recovered. The theft took place in August 2014 while the owner was away on vacation. Vienna investigators, with help from the Federal Criminal Police Office and Europol, found most of the works, with a combined value of $2.5M, in a Viennese apartment. They believe the theft was carried out by an internationally active Eastern European gang, however, no arrests have been made. Five works, with a combined value of 50,000 euros, remain missing. Canada’s Big Maple Leaf located at the Bode Museum in Berlin, Germany, is one of five coins printed with a $1 million face value. The gold giant weighs a whopping 221 pounds, measures 21 inches in diameter, is over 1 inch thick and, based on the current value of gold, is worth close to $4.5 million. Not an easy coin to pick up and stash in your back pocket; however, it still managed to disappear from the museum last month. Authorities believe that due to its weight, more than one person had to be involved … no arrests have been made. Wondering why Canada decided to print these?? According to the Royal Canadian Mint’s website…” because they can.” Oh Canada. I usually do not cover an entire sale or, in this case, a series of recent sales; but since the Asian Collectibles market is always on my list of things to explore, how could I not tell you about the recent sales at Christie’s during Asian Art Week? The Asian market is one of the hottest tickets in town and the results were really astronomical!! There was a series of seven auctions over three days which, when all was said and done, had a combined total of $332.8M – coming really close to the Post-War and Contemporary markets! These auctions achieved five times the presale estimate range and accomplished an overall sell-through rate of 88%! Objects included in the sale spanned many categories, including but not limited to, Chinese paintings, furniture and bronzes. There was active bidding from 37 countries across six continents…sorry nobody was bidding from Antarctica – I guess they are too busy with their experiments. So, let’s get on with the highlights of the sales. To kick off the week we begin with Fine Chinese Paintings that consisted of 95 lots, totaled $3.3M, and had the lowest sell through rate of just 78% - which actually seems pretty good to me. The top lot in this sale was a scroll catalogued as Ni Zan (1301-1374) - Landscape-A Gift to Ban Yun estimated at $150-300K. It more than doubled its high estimate selling for $667.5K. That same morning was the Ruth and Carl Barron Collection of Fine Chinese Snuff Bottles: Part IV – The sale contained 180 lots and had a 100% sell through! A White Glove -- WOW!! The sale’s total amounted to just $842K with most the items selling below $5,000! The top lot was an inscribed White Jade Snuff Bottle Imperial, Beijing 1770-1799 that sold for $40,000 (est. $4-6K). In the afternoon, it was time for the Indian, Himalayan and Southeast Asian Works of Art. A world record was set at this sale for a large and important Black Stone Figure of Lakanatha Avalokiteshvara that sold for $24.7M! The sale consisted of 42 lots and made just $26M … see, it just goes to show that one item can really make a difference! Now this next sale might be considered “the sale of the century” … really! On the evening of March 15th, the saleroom presented Important Chinese Art from the Fujita Museum and when all was said and done, 29 of the 31 works offered sold (94%) for an astounding $262.8M … I say astounding because the low end of the presale estimate range was about $26M! This auction alone far exceeded any previous records for any Asian Art Week series of auctions! This sale had so many impressive results, I really just can’t limit myself to the top lot – which was a handscroll (there were 6 in the sale). The top scroll was catalogued as Chen Rong (13th Century) - Six Dragons, it carried an estimate of $1.2 – 1.8M and eventually sold for a remarkable $48.97M! The second highest price in this sale for a handscroll was a piece catalogued Zhao Lingrang (Late 11th-Early 12th century) - Willows and Geese that sold for $27M (est. $750-950K). Coming in third in the handscroll category was Li Gonglin (1046-1106) -Treaty of Bianqiao which brought $17.6M (est. $800-1M) and last on our top of the charts for handscrolls was one catalogued as Han Gan (706-783) - Horse that made a measly $17M on an estimate of $500-700K! In fact, the 6 handscrolls in the sale made a combined $123.9M. But wait, there is more! Two important bronze ritual wine vessels also set record prices. Both were catalogued as A Magnificent and Highly Important Bronze Ritual Wine Vessel, Fanglei Late Shang Dynasty, Anyang, 13th-11th Century BC, although one had a cover. The first crushed the estimate and sold for $37.2 M ($6-8M), and the second one, with the cover, didn’t do quite was well … only selling for $33.8M on a $5-8M estimate. The next morning The Harris Collection: Important Early Chinese Art was on the block and ended with an overall result of $1.1M and a 93% sell-through rate. The top lot here was A Very Rare Gilt-Bronze Feline-Form Ornament, North China, 1st – 2nd Century, A.D. which sold for $119K on a $15-25K estimate. Up next was The Marie Theresa L. Virata Collection of Asian Art: A Family Legacy sale that garnered a total of $25M and sold 95% of the lots! All the proceeds from this sale are going to charities in the Philippines which include the Child Protection Network, ICanServeFoundation, Inc. and Cribs Foundation, Inc. The top lot was a Very Rare Huanghuali Circular Incense Stand. Xiangji, 16-17th Century, that sold for $5.8M against an estimate of $400-600K. And lastly, on the third day of sales, was Fine Chinese Ceramics and Works of Art, which totaled slightly more than $13M with an 80% sell through rate … do you think everyone had had enough? The top lot in this sale was A Bronze Ritual Food Vessel, Kang, Gui, Early Western Zhou Dynasty, 11-10th Century B.C. The vessel’s presale estimate was $100-150K and sold for $907.5K – not a bad way to end the week! This year, things got started a bit late… I read a few reports that the auction houses pushed things off for various reasons, one of which blamed the Chinese New Year. The most likely explanation however, is that they were buying themselves some time to set up these sales. Remember, both Christie’s and Sotheby’s had Impressionist and Modern Sales pushed back into late 2016 in New York and the offerings were mediocre with borderline decent results – at that point, they attributed the timing to the US election). Now just a few months later, they are scrambling to fill in a blockbuster evening sale – not an easy feat. We’re going to take this all the way back to late February when Christie’s kicked off the series of sales on the 28th with their Impressionist and Modern Evening Auction (and The Surreal Sale). The top spot of the evening went to Paul Gauguin’s Te Fare (La maison) at £20.3M ($25.2M – Est. £12-18M), though it is said that the owner (Russian billionaire Dmitri Rybolovlev) took a huge hit as the work was supposedly purchased for a whopping $85M – but that is another story. Well behind was Matisse’s Jeune fille aux anemones sur fond violet at £8.4M ($10.4M – Est. £5-7M – this same work sold in 2006 for $6.86M) and Picasso’s Joueur de flûte et femme nue at £4.6M ($5.7M - Est. £6.5-8.5M). The only big failure came at lot 22 with Rodin’s Le baiser, grand modele failing to find a buyer, estimated at £4-6M; 4 additional lots failed to sell yielding a 90% sell through rate. The total take for the evening was £93.5M ($116.1M), falling just under the top end of their £65.8-96.7M range. When we add in the Art of the Surreal sale, that bolsters the evenings total to more than £136.8M – that figure includes two works by Magritte, one of which set an auction record for the artist at £14.4M and the other not far behind at £10.2M ($12.7M … Rybolovlev paid $43.5M for it in 2011). Looking across Piccadilly, Sotheby’s was up on the 1st and oh boy they did not disappoint. Well above all the others on the evening was Gustav Klimt’s Bauerngarten – expected to bring in excess of £45M, bidding pushed its way above the £47M ($59M) mark. That price is a record for a landscape painting by the artist and is the third highest price ever paid for an artwork at auction in Europe. While Sotheby’s reported the sale with an anonymous buyer, it is being said the work was purchased by a foundation in Austria to replace recently restituted works. In a distant second was Picasso’s Plant de tomates at £17M ($21M – Est. £10-15M) and falling into third was Modigliani’s Portrait de Baranowski at £16M ($19.8M – Est. $10-15M). Rounding out the top 10 were quality works by Gauguin, Pissarro, Degas and a handful of other Picasso’s. Though there were 4 works that did not sell, only one should be seen as a big blow to the sale – a nice Sisley estimated at £5-7M failed to find a buyer. The Surreal Art was less impactful here as the Impressionist and Modern covered their £134.1-176.5M estimate, bringing in £177.2 – when we add in the Surreal Art, that total jumps to £194.8M. (Please note that charts have been converted to $USD). Shifting our attention to the Post War and Contemporary Sales… I have to say I am a bit surprised there were no “blockbuster” lots being offered up. Christie’s was up first and their top spot went to Peter Doig’s Cobourg 3 + 1 More at £12.7M ($15.5M - £8-12M). Second went to Rothko’s No. 1 (1949) at £10.6M ($13M – Est. on request) followed by Dubuffet’s Être et paraître at £10M ($12.2M – Est. £7-10M). Other big names including Rauschenberg, Calder, Basquiat and Warhol all had works surpass the £2.5M mark – the sale totaled £96.3 ($117M – Est. £67.5-101.6) selling 56 of the 59 offered (95% sold). 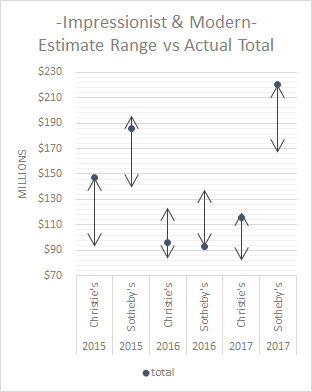 Sotheby’s had a similar sell-through rate but far exceeded Christie’s sales figure, as they were expected to. The top lot came quickly with Gerhard Richter’s Eisberg, bringing £17.7M ($21.6M) on an £8-12M estimate. A Basquiat took second, though it fell short of its £14-18M estimate, finding a buyer for just £11.9M ($14.5M). Filling in the top three was a new auction record for Georg Baselitz with his work Mit Roter Fahne (with Red Flag), which brought £7.5M ($9.1 – Est. £6.5-8.5M). Again, the standard evening sale characters filled in the remaining top 10 – Christopher Wool, Calder, Kippenberger, and Rothko all got in on the auction action. In the end, 57 of the 61 (93.4%) works sold for a total take of £118M ($143.7M – Est. £80.9-112.6M). These sincerely seem like decent sales… a high percentage of the works sold, there was decent competition for works and pieces that did sell made solid prices. I guess some of those concerns over Brexit are waning. Now we’ll just have to wait and see how things shake out in May when Sotheby’s and Christie’s take their shot on our side of the pond. Conflicting Reports – Does It Really Matter? After each report was released I received emails from various readers and clients asking for my thoughts. I will say this: these reports might be fun to read (if that is your thing), but there is no way that right now someone will be able to accurately assess the depth and breadth of the art market. It is not a regulated market and the details of most transactions will remain in the deepest/darkest crevices. When it comes to valuing the overall market, and comparing one year to another, there are so many factors that come into play: how many works become available, the condition of those works and any changes since the last time they were offered, the number of times have they been offered, their importance in both the artist’s career and the history of art, when the specific work was created, etc., etc. etc. How can anyone account for all of these factors? And let’s not forget a crucial one … no two works of art are the same, no matter how similar they appear to be. Dealer A has a painting worth $5M and Dealer B has a client for the work. If a deal is struck how is that $5M sale reported? Odds are, Dealer A states he made a $5M sale and Dealer B also states he made a $5M sale. In my mind this is one transaction; however, with both dealers claiming a $5M sale, it is not being reported accurately and there is no way to control this. TEFAF’s Art Market Report was the first to be released. In years past, Dr. Clare McAndrew conducted the research however, this year Clare moved over to Art Basel and the TEFAF research was conducted by Prof. Rachel Pownall (you can read her 224 pages if you have some spare time). Basically, the report paints a picture of a stable and resilient market, experiencing positive growth with total sales of $45 billion (up 1.7% from last year). It was also noted that the market experienced a decisive shift in sales … moving away for the auction forum to the dealer/private market. Auction sales were $16.9B (down about $4 billion, or 18.8%, from 2015) and the global mix was 62.5% dealer to 37.5% auction illustrating that the dealer market is benefiting from buyer confidence stemming from greater access to information and transparency on prices, preferring to buy through dealers than at auction. Privacy and anonymity, cherished in the Western world, in times of austerity and political tensions. Guess that is good for us! Later in the month Art Basel (Dr. McAndrew) released their findings and the size of the market was very different (you are also welcome to read her 286 page report). 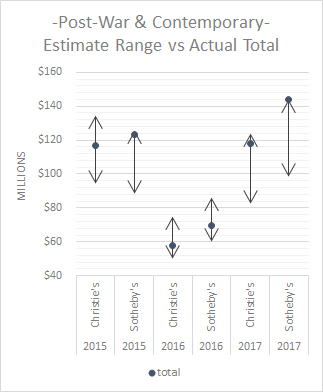 Dr. McAndrew pegs the number at $56.6 billion (down 11% from the previous year), with auction sales at $22.1 billion (down 26% from the prior year and industry leaders, Sotheby’s and Christie’s, losing 4% of their market share) and dealer sales reached $32.5B, up 3%. She claims that: in 2016, aggregate sale by dealers accounted for a larger share of the market at 57% by value, with auction sales comprising 43%. In addition, while sellers see geopolitical risks adding to uncertainty for 2017, buyers are viewing art and antiques as a relative safe haven amidst volatility elsewhere. This should increase prices for works that do appear on the market. I guess that is good as well. So, we have total market sales at $45B vs. $56.6B, auction sales at $16.9B vs. $22.1B and dealer sales at $28.2B vs. $32.5B. I do not know about you, but with spreads like that I walk away wondering if these reports can be taken very seriously. As I mentioned earlier, these reports only canvas part of the art market and according to the reports Art Basel contacted 6500 dealers and had a 17% response rate while TEFAF contacted about 7,000 and had a response rate of only 5%. Are those numbers really enough to come away with an accurate assessment of the market? If you want a complete understanding of the methods used and all the data complied, you need to read the full reports which are very long and include a lot of nice charts and graphs … I have always been told that people love colorful charts and graphs! What I take away from these reports is that the art market is very big and until worldwide regulations are put into place (which will probably never happen) we will never know how big it really is. Oh, just in case you are wondering, according to both reports the United States is still the biggest market – top in the Art Basel report at 40% and 29.9% in the TEFAF report … another BIG spread! In the end, I will keep on saying this – buy what you like, make sure it is a really nice example, in good condition, from the right period and try not to get caught up in the hype and statistical B.S. Gallery Updates: The gallery is open Monday through Friday during the month of April. We will also have a selection of contemporary works on display at Art Market San Francisco. Web Site Updates: We have added two new biographies to our website – Stuart Dunkel and Anthony Mastromatteo. We also added and/or sold paintings by: Sanchez-Perrier Herring, Perrault, Cortes, Vibert, Stobart, Jahn, Salaz, Palumbo, Tirrell, Bauer, Dunkel, Daly, Koeppel and Walter. Next Month: We should have more public sales to cover.